There are a few small screw holes where there was a blind. The Door is in good condition. Silent action will not frighten pets or disturb owner. An economically priced flap with uncomprimised quality. Cat Mate 2 Way locking cat flap in. Draft and weather proof fully brush sealed flap with magnetic closure. White suitable for use on Upvc / Timber doors, product ref - 215W. Draft & weatherproof brush sealed flap with magnetic closure. Draft and weather proof flap with vision panel. Lightweight flap can be used by cats. A STAYWELL CAT FLAP HAS BEEN FITTED. THE DOUBLE GLAZED UNIT IS OBSCURE. Brown suitable for use on Upvc / Timber doors, product ref - 215W. Draft & weatherproof brush sealed flap with magnetic closure. Draft and weather proof flap with vision panel. Lightweight flap can be used by cats. White suitable for use on Upvc / Timber doors, product ref - 216W. 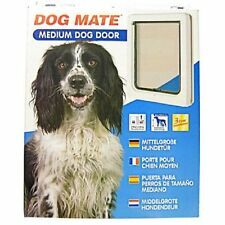 Pet Mate / Dog Mate large size dog flap in. Draft & weatherproof brush sealed flap with magnetic closure. Draft and weather proof flap with vision panel. Glazed panel width 520mm height 1010mm. 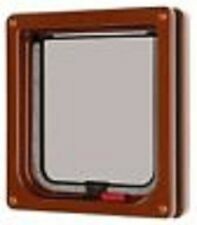 Dog/cat flap width of opening 220mm height of opening 240mm. 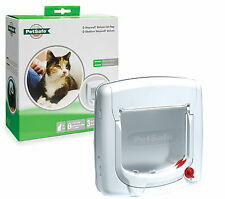 "Pet Mate" Electromagnetic locking Cat flap suitable for use on Upvc / Timber doors - White. Silent action will not frighten pets or disturb owner. Draft and weather proof fully brush sealed flap with magnetic closure. 645mm WIDE. HERE FOR SALE IS A WHITE RECTANGULAR UPVC DOOR PANEL MOULDED REINFORCED INFILL DOOR CARD. 268mm HIGH. WITH CAT FLAP. Easily installed. Available thickness:- 28mm. White Upvc flat door panel with a foam core. Upvc Door With Catflap. Condition is Used. Collection in person only. UPVC FRENCH DOORS WITH CAT FLAP. Glass is thick clear 28mm toughened double glazed filled with Argon Gas for extra efficiency. There is no condensation occurring inside the panes. One of the panes has a catflap hole cut out (approx 21.2cm). THE DOUBLE GLAZED UNIT IS CLEAR. DETAILS AND SIZES.